Until the 1960s, farm advisors addressed forestry issues and relied on specialists from UC Berkeley to assist landowners with a variety of technical matters, including fighting wildfire, utilizing wood, milling, and planting and management issues. With increasing demands for wood products following World War II, a specialist position devoted to forestry was created in 1964. 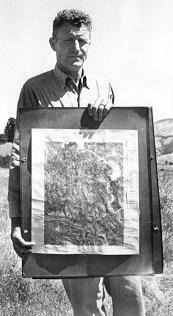 Robert Krohn was UCCE Humboldt’s first forest advisor, and his main area of research and outreach was on silviculture and management of second-growth forests. 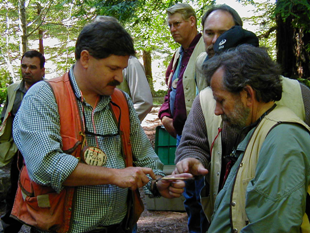 In the 1970s and 1980s, UCCE Humboldt Forest Advisor Paul Smith conducted several cooperative research projects with the forest industry, including studies on second-growth stand management and pest control, and led educational workshops on forest management for non-industrial forest landowners. In the 1980s, Forest Advisor Richard Harris helped landowners design roads to reduce impacts on water quality. Over the years, UCCE Humboldt forest advisors have assisted private forest landowners in preparations for new listed species under the Endangered Species Act, changes in forest policy and regulations, and estate planning. Forest Advisor Kim Rodrigues’ outreach on conservation easements contributed to the development of land trusts in Humboldt County. During the Timber Wars in the 1990s, Rodrigues also mediated conflicts and facilitated discussions between industry and environmentalists, leading to a better dialogue in the community. Today, the UCCE Humboldt Forestry Program continues to serve the community and address the needs of forest landowners by providing the knowledge and tools needed to create a balance between economic productivity and ecological sustainability. Through research, technical consultations, courses, workshops, and regional conferences, current Forest Advisor Yana Valachovic develops and disseminates knowledge on subjects including silviculture, forest policy, watershed management, oak woodland ecology, fuels management, and conservation biology. One of her major research projects involves collaboration with state, federal, private, tribal, and community groups and agencies to monitor for and manage outbreaks of sudden oak death. She was recently recognized for her sudden oak death management efforts and was given awards by CAL FIRE and the USDA Forest Service and Natural Resource Conservation Service. Valachovic has brought considerable focus to forest health and regional fire issues and has been able to expand the office staffing through successful grant writing. Additionally, Valachovic helps maintain the UC forestry website, where she answers questions posted in the “ask an expert” section. Education is also an important component of the UCCE Forestry Program. Since 1994, UCCE Humboldt has been a co-sponsor and organizer of the Forestry Institute for Teachers (FIT), which has provided over 500 K-12 teachers with the knowledge and tools to teach their students about forest ecology and stewardship. 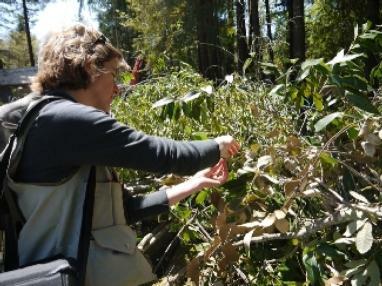 In addition, the UCCE Humboldt Forestry program continues to integrate the expertise of UC scientists through workshops, classes, and distance-based webinars on forestry-related issues. For example, the Forestry Program, along with other colleagues, has offered the national “Ties to the Land” succession planning classes.